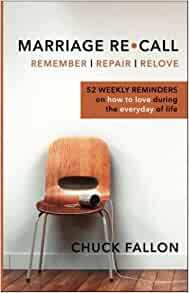 Marriage Recall is a compilation of 52 weekly reminders on how to love during the everyday of life. It’s a welcome knowledge-base to help keep your marriage on track or a trusty handbook on how to navigate through the tougher seasons—no matter how long you’ve been married. It can be used by couples, individuals, or in small groups. The chapters are short and filled with practical advice and humor, covering a specific skill or perspective—with a weekly journal page so you can apply it to your own situation. Read them in any order you would like. The steps are doable, even simple—but they are not easy! They rub against what has become standard practice in your marriage. They ask you to do something different, if you are in a rut. They invite you to change something that seems insignificant, but truly isn’t—so that the displaced value of your marriage can be remembered and repaired. Marriage Recall pulls back the curtain on couples counseling, giving you a peek into the lives of courageous people struggling with everyday situations, and learning how to love through them. Section One—Remember, focuses on how to build communication skills and resolve conflict. Section Two—Repair, offers techniques to help with tough issues like infidelity, separation, or divorce. Section Three—Relove, suggests resources to enhance your marriage that often go ignored until getting help is critical. It’s my suggestion that you read the entire book. If you do, you’ll be ready to help yourself, your spouse, and other couples be intentional about building a successful marriage. You can do this! Chuck Fallon, LPC, is a marriage counselor in private practice and a coach with Divorce Busting®, an internationally known organization founded by author Michele Weiner-Davis. 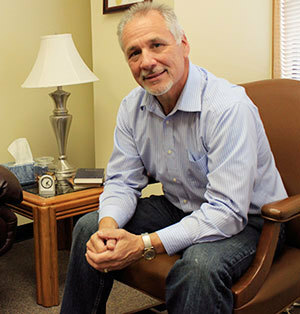 Chuck serves as a Marriage Rescue and Every Man’s Battle counselor with New Life Ministries at their conferences held annually throughout the United States. Chuck speaks at churches and groups on marriage and relationships from a spiritual and therapeutic perspective. He lives in Lakewood, Colorado, with his wife Jan and nearby their three grown sons. I have never read a more well organized and simple marriage help book. I loved the use of examples, scriptures and the goal of keeping the family unit together. It was a very useful and practical book and I will continue to use it for helpful reminders in guiding me to keep my marriage strong. I must confess I was a little skeptical when this book was recommended to me by a friend. I was however immediately fascinated with the way the book was divided into easy segments not only to read but to understand as well!! I would definitely recommend this material for not only couples having problems within their relationship, but also to those who may have become stagnant in their love life. When I got the book I was curious to read tips and pointers on marriage. I love hearing other perspectives. I've been married 9 years. We have had our ups and downs, as any couple. This book (which is done/read weekly and I'm not fully through) brings out points I've never even thought of. The scenario examples and descriptions help to relate to my own relationship. I've been pleasantly surprised at the progress my marriage has had. It's a whole new perspective. I can't wait to get next weeks "reminder" and reflect on things I've never given much thought to. We found this book to be a helpful tool use in focusing on ways to improve our communication and understand each other. We liked the real-life examples Chuck provides in each of the weekly chapters. This is a positive, up-beat book, even while addressing some of the serious challenges marriages face. The RELOVE section alone makes this a worthwhile investment! My husband I have enjoyed reading this book together and discussing each chapter. It helped us to talk about some hidden issues that we would not have discussed otherwise. I would have to say that "Respecting the Wall" was one of my favorites. The way the book is designed allows us to use it over and over again, finding some more good nuggets to improve our marriage. I've read this book and it's chock full of practical advice. I've read a ton of marriage books and this one is truly different. I wish it had come along in a different season in my life and saved me a lot of grief! If your marriage is on the rocks, or if it's sailing along just fine, you WILL benefit.